Aries and Cancer bring together two very different personalities ruled by opposing elements. However, these differences can make this relationship interesting. Just how different are they? An Aries individual is devoted to the family, but not at the same level as Cancer. Truth is too much affection and demands from family or friends may make the Aries feel smothered. A Cancer on the other hand, feels the need to give and receive a lot of attention from partner and family. Aries being the initiator, wants to get out in the world, explore and conquer and bring it home as a prize while Cancer only wants a stable life and taking risks is not his/her cup of tea. An Aries needs to have his individual existence and freedom, while a Cancer has a constant need for intimacy and mutual dependence. This may make Aries appear as aloof, uncaring and indifferent and a Cancer look too needy and sensitive. At times, Cancer may feel as if he/she is the only one contributing to the relationship. How will this work? The compatibility of this relationship will depend to a great extent on how much both the individuals learn from and understand each other. Aries can teach Cancer how to become independent while he can also learn compassion and a little sensitivity from the crab. Adjustment is the key word in an Aries Cancer love match. Aries will have to learn to control his frank speech, or he may hurt the sensitive crab unintentionally. Cancer also needs to learn to speak up when something is bothering her instead of hiding inside her shell. Aries will have to dial down his fast paced lifestyle, and Cancer may try being less moody and taking every little sign as an insult or slight against her. Communication is the key in this relationship. Aries and Cancer must be patient and try to understand each other if after realizing their differences they would still want to stay together. Aries man and Cancer woman create a lovely relationship with the contrasting elements of fire and water which at time lead to rough patches but all is well at the end when love manages to untangle the knots. Cancer woman has the potential to keep her Aries man happy and contended with her love and care which he always desires. She is the best friend and companion who will always stay with him. Aries man must make sure that he makes his Cancer woman feel secure as she is extremely possessive about her man. She may at times act emotional and irrational because of her extra protective nature. He needs to understand her mood swings and should accept them without losing his cool. She always wants to protect her man from negativities. She knows how to comfort him and ease him. She should learn to trust her man and give him his freedom otherwise it can actually lead to conflicts. He has the ability to fill her life with hope and passion. The instability of an Aries man may not go down too well with a Cancer woman. His casual comments might break her soft, vulnerable heart. She may shower him with too much love, care and concern, which may make him feel smothered. Her idea of a small, cozy love nest may not appeal to him much while she may get too jealous if he throws admiring glances at other females. If an Aries man learns to provide her that emotional comfort every now and then and the Cancer female learns to let him have his much-needed freedom, this relationship has the potential to run very smoothly. An Aries woman is an impulsive and sovereign lady. She meets all the obstacles headlong and headfirst, even when she must go out of her way to find them. An Aries woman may seem inconsiderate and thoughtless but she would never hurt anyone on purpose. She can actually find a real gentleman in her Cancer man who is able to look behind the veil of rashness and admire her innocence. An Aries woman needs to keep her temper in check as it can often depress her Cancer man. An Aries woman is always on the move, while a Cancer man would rather stay home and unwind. Even though there’s immediate attraction between both signs, they will have to work hard to make it last. She will want her freedom and individuality and may find him too possessive and restraining. On top of that, dealing with his constant mood swings may just be too much for her to deal with. Both are pretty stubborn and unyielding. Either one of them or both must be willing to compromise for this relationship to work and last. 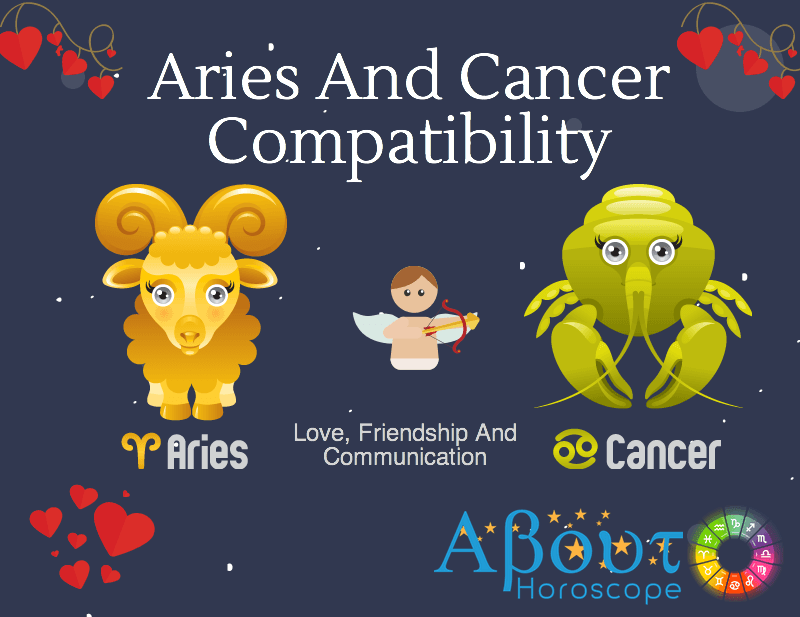 When Aries and Cancer are together there can be many differences that are to be taken in consideration. Attraction is instantaneous but over time, there is always a certain amount of possibility to clash on almost any subject, due to their different approaches in life and love. But if they consider each other’s differences well and are willing to adjust to the needs and demands of each other, they can actually enjoy a relationship that is fulfilling both in fields of passion and security topped with love and enthusiasm at all times.